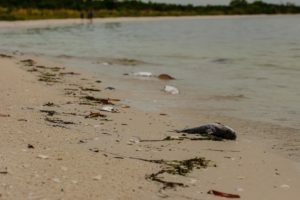 EN Photo by Bret Munson // A dead fish lies on the shore at Lovers Key State Park in Fort Myers. You’ve seen it in the news, on Facebook and, if you have been to Fort Myers Beach lately, you’ve seen it in person. Red tide, a respiratory infection-causing alga that is lethal to wildlife (and still dangerous to humans), and it seems like this year might be the worst red tide in a while. I’m from Englewood, Florida, about 50 miles north of FGCU. Englewood is a small town and our economy depends on tourism and beach life. This economy, however, is now in danger. After going to the beach to see the effects of red tide for myself, I know something must be done. Seeing dead fish, crabs, turtles, birds and manatees isn’t easy to stomach. However, I’m not really sure how to advocate for this change. Of all the possible routes I could take to achieve some sort of improvement, the one I see the most is pointing the finger. Point the finger at Rick Scott. As governor of Florida, Rick Scott was in the position to change regulations and make it easier for sugar companies to dump their phosphate-filled pollution into Lake Okeechobee. Point the finger at big sugar. Big sugar is the one causing the algae bloom in Lake Okeechobee. Point the finger at Republicans and Democrats. Because of the divide in our country, change hasn’t come. Point the finger at lobbying. Point the finger at local politicians. Point the finger at society. Point the finger at yourself. When you’re done pointing the finger, maybe then it’s time to make change. Protest what’s going on. There have been protests going on for months, ever since the US Army Corps of Engineers opened the floodgates of Lake Okeechobee, letting dirty water into the Caloosahatchee River and then into the Gulf of Mexico. Be informed with legislation and propositions regarding the area. There have been plenty of ideas proposed, but without the support of people, many propositions fail. Vote for change. Because 2018 is a mid-year election and Florida has elections in November, you are able to vote. Vote for someone who cares about our environment. EN Photo by Bret Munson // While fish aren’t the only animals being killed by red tide, thousands of them are being hauled off from local beaches. 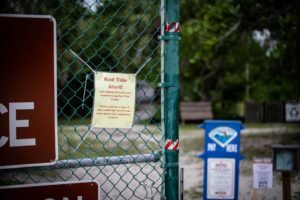 EN Photo by Bret Munson // Red tide warnings are active along the Gulf Coast, with no-swim warnings at some local parks.